Sweetest that ever I heard." In summing up my worldly achievements in more than 60 years of life, I am at a loss to find anything worthwhile to report, except that which I have done to make Jesus Christ known, pointing people to the World's ONLY Saviour, Healer and Deliverer! I am convinced that all else - higher learning, social standing, wealth, political aspirations and good deeds - pale into insignificance when compared with the "cross-work" of Jesus! Like St. Paul, I am persuaded that all else is "dung" and that life's most important accomplishment is to believe, accept and propagate the Gospel of Christ to "fallen man", for the glory of God. To be a "vessel of honor" and a channel of God's blessing ministering His grace, goodness and power to a lost, sick and suffering world is mankind's greatest achievement! All else is vain and for naught, when examined under the scrutiny of God's Word and in the light of eternity! Taking into consideration the many things I have seen and experienced, people I have met, together with all the books and journals I have read during 30 years of "world evangelism", I still wonder at the grace of God to me. Oh, take me as I am." There is no one as wonderful as Jesus. Everyone who hears His gospel and is impacted by His power, must realize that He was, is and always shall be WONDERFUL! We stand in awe as we consider His supernatural conception, birth, life, death and resurrection. As well as the outpouring of the Blessed Holy Spirit upon His Church for the past two thousand years! The words of the prophet - uttered 700 years before His birth at Bethlehem - under the inspiration of God - should not surprise us. THE WORLD'S GREATEST LOVE STORY! The story of God's great redemptive plan is without equivocation, the greatest love story ever told. No human drama - ever so tender, touching and grand - could even begin to compare with God's love for mankind. Nobody ever has told it to me! Nobody ever has told me before. Need I not perish-my hand will He hold? Nobody ever the story has told! Then I am sure that He sent Him for me. Lord I believe! Tell it now to the rest." Nobody ever has told it before. The urgency conveyed by that song, which I learned at Daily Vacation Bible School - at our Lutheran Church in rural Saskatchewan - made a profound impact upon my young heart. I remember weeping as we children drove our horse and buggy home from church that summer day, so many years ago. Even then, I secretly hoped that one day, I would be able to preach the gospel to other little gypsy boys. Throughout the years, it has been my great privilege to proclaim the glad story of Jesus to this world's unfortunates, gypsies included. 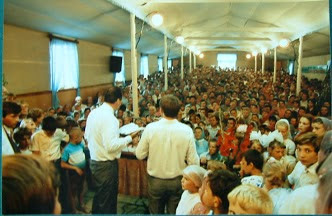 And presently (1992), I am preaching in Russia, Ukraine, Latvia and other Eastern European countries. Only the great love of The Eternal, and Jesus Christ's sacrifice on Calvary was able to free us from Satan's grasp. There was no other way! Messiah Jesus died upon Golgotha's hill - between two thieves as a common criminal - just like Jewish preachers had prophesied centuries and even millennia earlier. Just like the sacrificial lambs which had been slaughtered on Jewish altars for centuries - a type of the coming Lamb of God - Jesus died on the cross, for the sins of the entire world. It would stretch from sky to sky. The saints and angels song." It's hard to fathom God's love. It is past finding out. His grace is unlimited and His mercy reaches out to all men everywhere...even to those who hate and despise Him and His gospel. It encompasses the entire world! His great love engulfs even those who persecute His emissaries and blaspheme His great, holy and lovely Name. It encompasses the entire world. It is small wonder that St. John, overcome by the goodness of God, exclaimed, "We love Him because He first loved us". (1 John 4:19). AMEN. NOTE: This is the first chapter of the book, written in 1995. We will share more in this blog. m.s.